either in flight, take-offs or landings. This guy was in fine take-off form. After 4-5-6 wing flaps, he's up up and up! They seem like 747's. Huge and heavy ... yet weightless once airborne. The views they must have. Now on to more serious matters. See this photo below. A nice shot of the beach from this morning's walk. What the heck are those spots in the sky. I've noticed it on other photos which I've edited out, but this one is bad. At one time I thought it was on my lens so I cleaned them. But I'm still getting these spots. Has anyone had a similar thing happen? I'd be interested in your feedback. i rather like it! looks like the contrails and spots are reflecting the beach and seas below! Cool images of the Pelicans. They are amazing to watch land, takeoff and dive. I love the shots from your walk on the beach. I can not help with the spots though. Even with the spots, you have a gorgeous photo. Have a great day. These are great pictures!!!! I have never seen those kind of spots unless they were on the lens, real mysterious!! Let us know if you find out, how often do they show up?? I really look forward to your photos!!! Just sent you an e-mail with pictures of them on my wall, they came out gorgeous!!! I feel the same way about the pelicans. I see you have the same problem as I do on your camera. I had mine cleaned once and the spots were gone. I think, tho I'm not totally sure, but I think it's from moisture...Just my 2 cents. Oh, I do love the pelicans and your shots from the beach are wonderful! I've had the same problem with "dots" and have no idea what it is. Sometimes they disappear when I download them to Picasa, sometimes they just fade????? Does sound and look as though you're having a great time there! Enjoy the sun -- and the pelicans, Reena! Yes. There is dust/dirt on your sensor. The D7000 claims to have a self-cleaning sensor but mine is new so I haven't used it yet. I did see something in the manual about it, though. For my old camera, I had to send it off to Nikon to have it cleaned. It took about 2-3 weeks for it to come back. Sent it through a local camera shop. Of course, shortly after I got it back, the specks began reappearing. I got really tired of cloning them out in PS. They are always more noticeable when there is sky. Good luck! Do you have a filter over your lens? I use a UV filter and for landscape photos also use a polarizing filter on top of that. It could be moisture, but why is it showing up after editing? What program are you using? Have you cleaned your sensor? Very strange. I can see them in the first shot so the editing just enhanced them. It has to be from your camera so I'd check the filters and the sensor. Reena, the spots on your sky are dust motes inside the camera. I had them too in my Nikon. My (photographer) son advised me to remove the lens, turn the camera up-side-down and using a very clean camera puffer to blow upwards into the camera and they can (sometimes) be dislodge. All this in a dust free environment, of course. No matter how careful we are when exchanging lenses or photographing in a dusty environment, these things do happen. I sent my Nikon to the cleaners and bought a Canon to play with meanwhile. Just as well I did, since it has been in hospital now for months !! Yup, they're definitely on your sensor. There are several cleaning products you can use yourself but some spots are really stubborn and you might be best off taking it into a place where they can clean it for you. Mine got really bad at some point and I brought it in last summer. A half hour later it was just fine. They're beginning to collect again though. It cost me $40 to clean.. well worth it since my own attempts to clean it with products that cost about as much made it worse. Good luck. Looks like the spots are on the sensor inside the camera. Maybe they got there when you changed lenses. Does your camera have a self sensor clean mode? If not I would send it off to have it professionally cleaned as it's easily damaged. Love the pelican shots. beautiful! love every single one. My favorite bird, the Pelican. We are on the way to Pelican country right now. Hi Reena...bummer...and grrrr that's the way I would feel to especially since your on your trip!! I have no answers, but it looks like you have gotten some good advice! Like everyone is saying, sensor, that is if you have cleaned the lens on both ends. Try another lens, go outside and shoot straight up in a clear sky. If the spots are in the same places, sensor. You can clean it yourself and your manual will tell how. Just DON'T touch the sensor! Not even with a brush designed for cleaning lenses. Use a squeeze blub air blower, not compressed air. Save that for the pros if you have to take it in. I was able to do my Nikon. I could see the specks on the sensor. Got all except for one last speck and just about gave up but then the last puff got it. Also when puffing, hold the camera facing down so gravity will help getting the dust specks out. Good luck. Gee, I forgot to tell you how much I like those pelican shots. Do some more landings and take-offs, they're cool. I am also fastenated with the pelicans. They are huge and I get so much detail from the photos. Could there be something inside your lens? I love pelicans too. Our daughter and son in law live on the beautiful NC coast. Each time we visit..they know I'll be entertained for hours if they take me to the waterfront. Oh my word...you do have dots on your pic. What in the world...maybe there is a full moon tonight. Even with the dots the picture is gorgeous!! Your photos show such majesty in their wings. Great pelican pictures. My sister was telling me that a lot of the pelicans go blind from diving into the the water and hitting it so hard. I wonder if that is true. Such great shots my friend.. I am so jealous.. 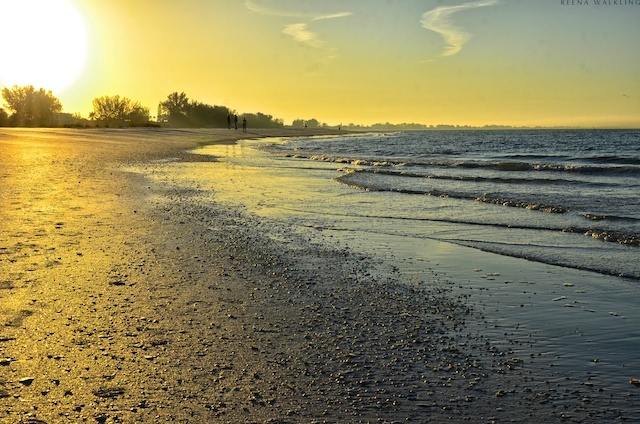 I want to take a stroll on the beach with you!!! My photography teacher had told us never try to clean the sensor on your own.. He states that you can damage the sensor. And he stated that means a new camera. He said it is worth it to take it in to a shop and have it cleaned.. I really don't know if that is true or not.. You might want to ask all the fine people here in blog land if anyone has ever cleaned there own sensor.. I would love to know if it can be done.. I do hope you enjoy your trip!! The spots are dust on your sensor. I would recommend being very careful when cleaning it. I marked up my first camera's sensor and it was expensive to repair. Do not let anything touch the sensor. And make sure your camera is off when you change lens. The sensor is charged and pulls dust in, especially in dry weather. I love pelicans- they are like something from another planet. 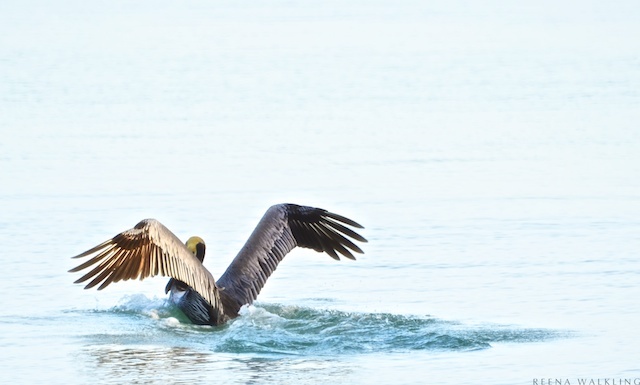 I'd love to get the chance to photograph some pelicans! yep....sensor dirt/dust....does your camera a setting for self dust removal ? and i agree with others.....ALWAYS take your camera in to be cleaned....always !!! What a fabulous sunrise...you're obviously an early riser! I have the same problem it is dust on your sensor. You need to clean your sensor hopefully it comes off. Unfortunately it didn't come off on mine. It only shows up on sky shots so I have to clone them out bummer. You must be in Florida again ??? Every single time I go anywhere I take at least one picture of a pelican. I love them so much. the beach pictures are great; I couldn't choose between them. I don't know how anything can take off of water. It would be such a drag on you. It's tough just climbing out of the pool. 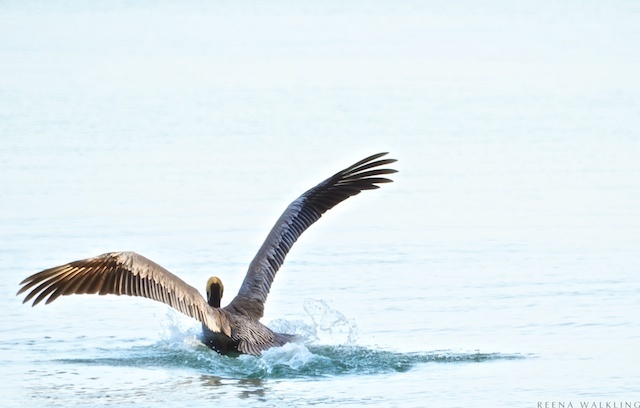 Wonderful pictures of the pelicans-in flight or alighting on the water. Almost like in watercolors. Do the spots show up on the same place in series of different shots? Dust spots or defective pixels in the sensor? 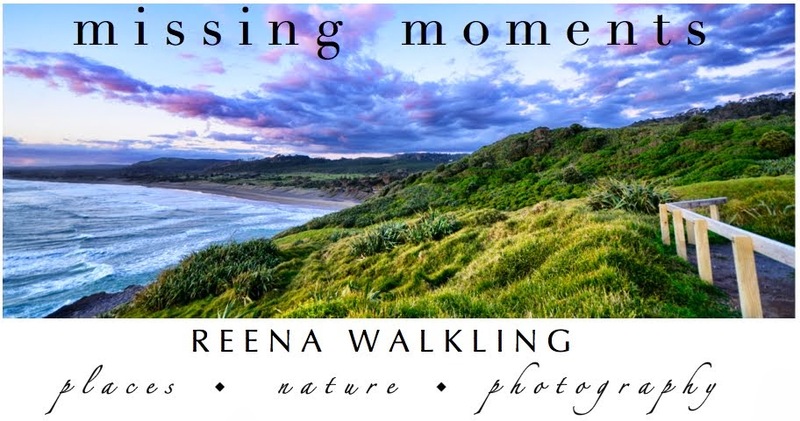 Hello Reena's always nice to see your fantastic photos. I can not help the spots on the photos, if you did not mention I had not even noticed. What can I say but WOW, WOW and more WOW! 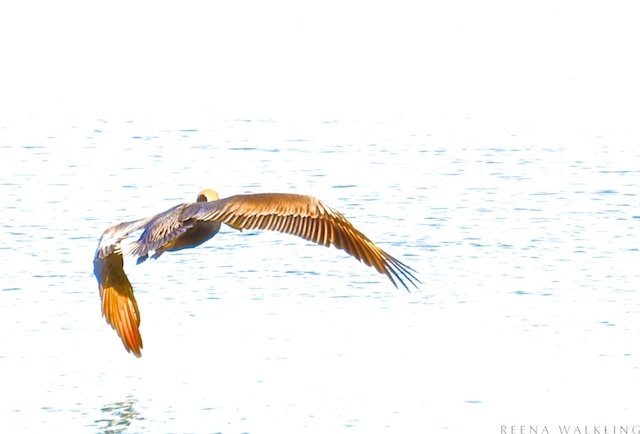 i love pelicans, love watching them and photographing them. these are great captures of flight. we watched several fly over our back yard yesterday and watched until they were out of sight, they just float on the currents without moving their wings. The pelicans are so regal and beautiful! The spots are probably on your sensor. Looks like it's time for a cleaning. Know you will hate to part with your camera!! Love those pelicans but sorry can't help with the spots. Dust on your sensor....but anyhow gorgeous pictures ! No fair you still got pretty things to photograph. Stunning really. Many more people have camera knowledge than I do...but I agree that it has to be inside the camera. My older Pentax has some spots...I've cleaned lenses at both ends, but the spots (in the sky) are still there. I bought a new Canon T3i before Christmas, so I'm not worrying about the other DSLR right now. As for the pelicans: I cannot believe how much detail you have captured in their feathers!!! i love pelicans too! i can watch them all day. Gorgeous shots. I think a trip to a good camera shop is called for to investigate those spots. Frustrating isn't it! 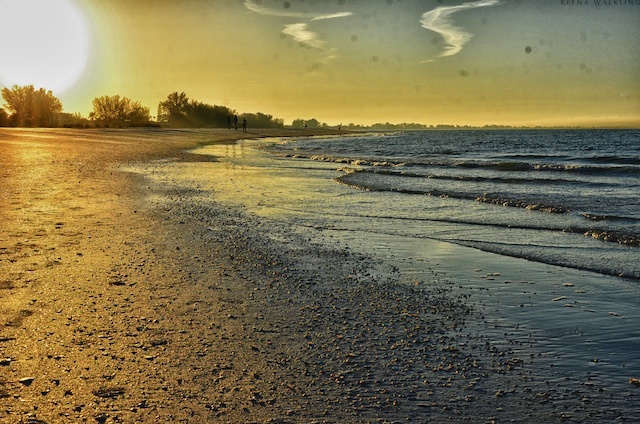 When I got my first DSLR I was so excited to take it on my trip to the beach shortly after. I was changing lenses out there and ended up with dust on my sensor like that. It did require a trip to the repair shop for a cleaning. Lesson learned! Great shots of the Pelican - they are amazing! So big and so wonderful. Great shot of the beach!